If you know me you know how much I love bronze, golden and copper colored eye shadows; I just can’t stop hoarding them. On my last visit to the PAC store in Mumbai, I picked up few eye shadow monos from them and today I’ll be reviewing their Pure Pigmented Eyeshadow in PP 24 (Brew). Read to find out if it is worth buying or not. Mix and match these 42 brilliant metallic to achieve stunning eyes in seconds. Pop your favorite shades into one of our magnetized custom shadow pro magnetic pallets for a totally personalized eye shadow experience. Easy to blend, this also is Pure Pigmented with a full Color Payoff available in variety of Shades. The eye shadow come in normal steel eye shadow pan which is further housed in a sturdy scissor locked plastic case. The plastic case is supposed to protect the product inside from any sort of damages. The shade number is written at base. 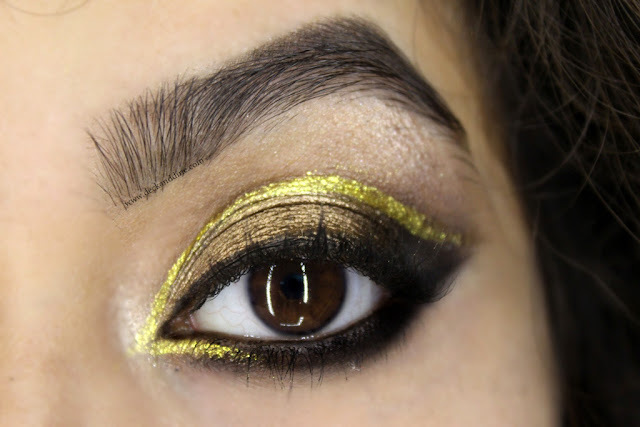 A super gorgeous bronze colored eye shadow with hints of gold. It has a metallic finish. Very festive, very Indian. This will rock any party/wedding eye makeup. The shimmers are fine and add a beautiful sheen. The eye shadow has a very smooth texture, does not feel chalky, is easy to apply, blends well and there is no fall out at all. Very rich, shows even without a primer. The shade is buildable and thus can be intensified as per choice. The staying power is awesome and it stayed intact on me for more than 6 hours. No smudging or fading. I am a big fan of bronze, copper and golden eye shadows. They look great on our Indian skin tone. This is a beautiful shades, is smooth, well pigmented and lasts long. I’m in love with this. At this price these eye shadow pots are one the best budget eye shadows available in India. I would definitely repurchase this and would recommend to everyone. Also I just can’t wait to buy the other shades. Have you used PAC Eyeshadows? Which one is your favorite? Checkout the review of another PAC eye shadow HERE. Pigmented and stunning. The shade is amazing.